As you can see from some of my other blog posts we have a rather large greenhouse, this is great apart from when we need to clean the thing in winter. One of the things which is always hard work is cleaning the glass. 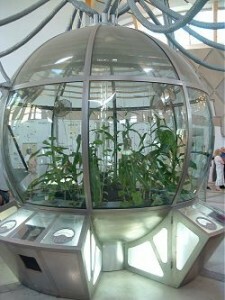 We have an internal glass partition as well so there is even more glass than a normal greenhouse. It normally takes me two of us a couple of days really to do it properly, And lot’s of aching arms as we have all the glass above our heads to do as well. 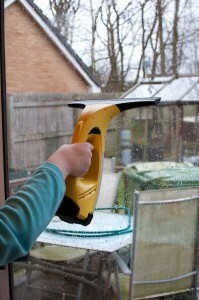 I noticed a while ago that Karcher had released a window vacuum cleaner called the WV50 . I’m always a bit sceptical about things like this but after reading all the reviews on amazon it did appear that this gadget might actually work. After looking around for the cheapest price, Amazon appeared to be at least as cheap as everyone else at £47.47 and included free delivery for just the vacuum. They also had the plus version at £59.85, This is the pack I purchased. The thing which makes this the plus version is the extra Kärcher window cleaning agent and applicator bottle accessories. This is actually a fancy way of saying a little pack of window cleaning detergent and a spray bottle with a microfibre cloth attached to it. I ordered it and received the vacuum cleaner pack a few days later. The thing itself is rechargeable so you need to recharge it before use, And they tell you to recharge it after every use. I’ll go along with this as I didn’t recharge it once and it didn’t last very long when I tried to use it again. I think it only takes about an hour to recharge though so it’s not to bad. On a full charge I managed to do about half of the greenhouse which took about half an hour and no achy arms. 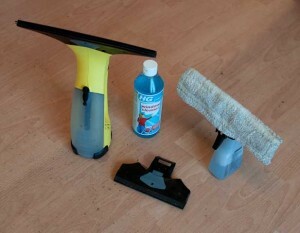 You can use the vacuum cleaner without the karcher spray bottle but this seemed to just make things so much easier and more fun, Basically you fill the squeezy bottle up with window cleaning mixture (A portion of contentrate is supplied with the spray bottle) then you simply squirt the bottle onto the window and then wipe it around with the attached cloth. Then using the vacuum cleaner you simply vacuum the dirty water up in one downward stroke. It seems too easy to be true but it does actually work. It’s weird vacuuming the window at first though. At first we did try to push the vacuum cleaner a bit too hard on the window and it ended up with some streaks, Using less force though ensures there are no streaks and makes it nice and easy on the arms too. The dirty water on the window is sucked into the vacuum cleaner and into a little see through section on the front of the vacuum cleaner. You can see how yucky the window was before you cleaned it by all the dirty water it collects. The section has a little pull of plug which you pull of to allow you to pour out all the dirty water after it’s full. 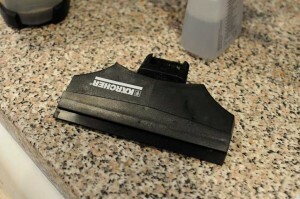 The vacuum cleaner and it’s rubber cleaning head come apart to allow you to easily clean them with a wet cloth. The pad on the spray bottle also comes off to so you can just clean it in a sink full of warm water. We actually found the whole window cleaning process quite good fun. After cleaning the greenhouse we went hunting out other windows which hadn’t been cleaned for quite a while to have a go on. Even our daughter found it fun as she went round to our parents and cleaned their windows for them, obviously wanting to be paid for it though, She is my daughter after all. As our house has fairly new windows it has windows in the upstairs rooms that can be specially slid so that you can clean the windows from inside the house. 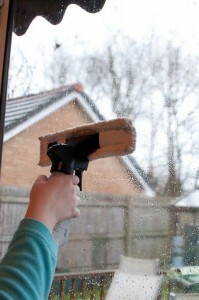 This gadget is brilliant as it now allows us to clean all the windows around our house including these upstairs ones so easily. The only thing we did have to purchase afterwards was the Karcher 170mm Small WV Head , This is a smaller rubber suction head and allowed us to do the awkward parts of the greenhouse which have very narrow panes of glass. This accessory would be handy for narrow windows around the house as well. Also rather than buying the karcher window cleaning concentrates I found some window cleaning concentrate on amazon for a fraction of the price, All the reviews said it was excellent and having tried it I must say I agree. It seems to do at least as good a job as the Karcher concentrate, It comes in a 500ml bottle and is called Hg Window Cleaner. You just need about a capful into the karcher spray bottle and top up with water. It says on the side of the bottle it’s used by all the best professionals so it should be just about good enough for me now I’m a would be professional. I don’t think we will be going back to the normal way of cleaning again after playing with this gadget. 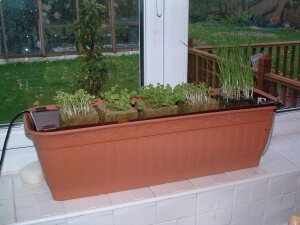 The design has come about because we originally grew herbs inside using soil, This became quite messy with the continuous watering required and soil getting everywhere. ** Warning ** If you are having a go at making something like this yourself, Great care must be taken because liquids and electric are being used close together, If you are not sure about what you are doing or what precautions you should be taking please don’t attempt anything like this. It would be better and more safe for you to consider buying a ready made kit such as Nutriculture Gro tank kits as shown on some of my other pages. Now back to the design, The design has come about because we originally grew herbs inside using soil, This became quite messy with the continuous watering required and soil getting everywhere. A plant container the right size for our windowsill. A small length of guttering which will fit inside the container. Two end pieces for the guttering so the guttering is water tight. A small hydroponic pump with outlet pipe. 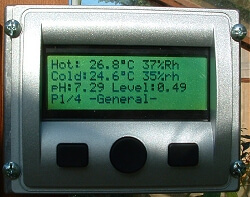 A digital electric timer for the pump capable of a 1 minute interval. A length of clear tubing for a simple level gauge. 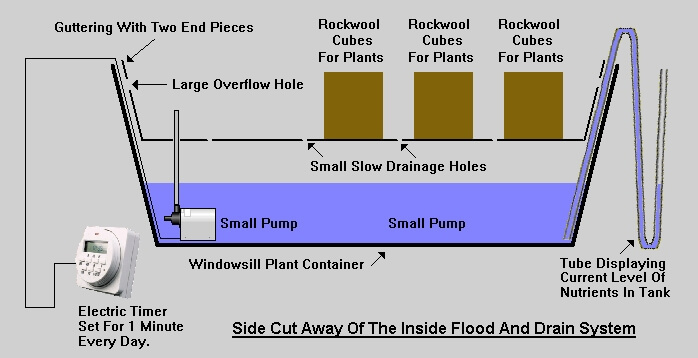 The diagram below shows all the pieces put together, Below the diagram you can find full details on what steps were involved in constructing it. Building the system started with cutting a piece of guttering to length so it was a snug fit into the plant container when both guttering end pieces were fastened on. Several small slow drainage holes were drilled into the guttering so the nutrients when pumped into the guttering would be able to drain slowly back into the bottom of the container. Several very large overflow holes were drilled near to the top of the guttering incase the pump was able to pump the liquid past the top of the guttering within the time set on the timer, This would also ensure that the system would not overflow if the timer was set wrong or failed to work correctly. Another hole was drilled into the bottom of the guttering for the outlet pipe of the pump to fit through.